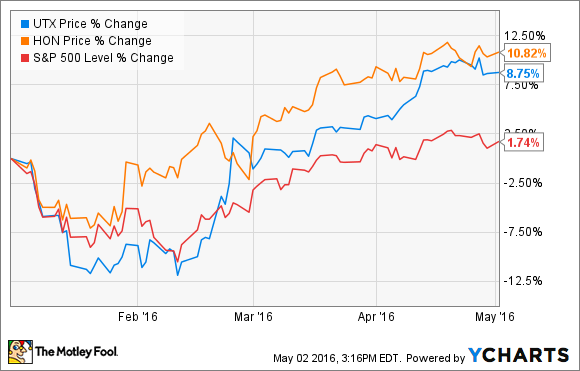 Is Honeywell International Still a Good Value Stock? A look at prospects for the diversified industrial stock for the rest of 2016. In common with its peer and sometime acquisition target, United Technologies (NYSE:UTX), Honeywell International (NYSE:HON) has had a good 2016 so far. But can the good times continue? Let's take a look at the updated investment thesis for buying the stock in the light of Honeywell's recently released first-quarter results. With a trailing P/E ratio of nearly 19, Honeywell isn't an obviously cheap stock, but upon closer inspection, it has plenty of upside potential. In fact, if it merely hits its long-term targets, the case for buying the stock is a strong one. The best argument in its favor rests on its underlying free cash flow generation. The following chart shows Honeywell's enterprise value divided by its free cash flow. It's a useful measure because it tells you how much you are paying for a company's FCF generation. Looking ahead, Honeywell's target for free-cash flow in 2016 is $4.6 billion to $4.8 billion. Based on its current EV of $96.2 billion, and the midpoint of FCF guidance, Honeywell's forward EV/FCF valuation is 19.7 times, which looks low compared to the bulk of its valuations over the last five years. 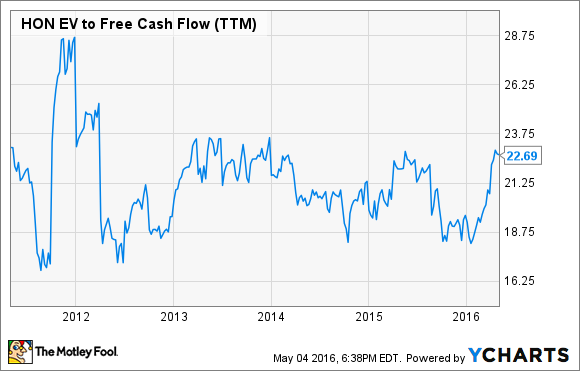 HON EV to Free Cash Flow (TTM) data by YCharts. However, that's not the whole free cash flow story for Honeywell. The company is in the middle of a five-year (2014-2018) plan to expand sales and margin. As such, it's ramping up capital expenditures (most notably in its performance materials and technologies segment) in order to generate future growth -- and that's eating into free cash flow generation. To put this into context, Honeywell has converted net income into free cash flow at a rate of 113% on average in the last 10 years, while its four-quarter trailing figure stands at 87%. However, management expects the conversion rate to get back to 100% by the end of 2017. If we assume the company will hit analysts' estimates for EPS of $6.66 and $7.24 in 2016 and 2017, respectively, and assume a 100% FCF conversion rate, then Honeywell is trading on underlying EV/FCF multiples of 18.2 and 16.8 for the next two years. As the chart above makes apparent, those projected figures make the stock look even cheaper than just gauging its valuation on a reported FCF basis. Which leaves us with a key question: Will Honeywell hit its earnings targets? Let's take a look at the trends in the first quarter to help answer this question. In a nutshell, Honeywell's first quarter saw stronger-than-expected sales growth (core organic growth of 1% compared to guidance for negative 2% to flat) offset by weaker margins (segment margins of 18.1% compared to a guidance range for 18.3% to 18.5%). The result was that EPS came in at $1.53, at the top of its guidance range of $1.48 to $1.53. Going in to the first quarter, there were some concerns for the aerospace original equipment market after Alcoa (NYSE:AA) lowered its full-year forecast for industry growth. Alcoa's management argued that "unprecedented" levels of new aircraft models were lowering demand for legacy models, and aircraft manufacturers were choosing to "carefully" ramp production on the new platforms. Indeed, as United Technologies VP Paul Lundstrom explained, "Unfavorable commercial mix, largely from the transition to next-generation platforms and the drop through from lower military sales, were significant headwinds in the quarter.... [which were] partially offset by additional cost reduction actions and pension tailwind." However, Honeywell actually outperformed internal expectations with its commercial aviation original equipment business in the first quarter -- an indication that it's relatively well positioned with its aircraft programs.As such, overall core organic aerospace sales grew 3%, ahead of guidance for 1% to 2%. ACS segment margin declined 140 basis points (where 100 basis points equals 1%), compared to guidance for a fall of 80 to 50 points -- but don't panic. Honeywell's building solutions and distribution sales (relatively low-margin products) generated stronger-than-expected sales -- negatively impacting margin, but leading to overall ACS core organic sales growth of 4%, which exceeded expectations of 2% to 3% growth. Here again, core organic sales were better than expected (declining 8% compared to guidance for a fall of 11% to 13%), and the segment's margin decline of 90 basis points came at the more favorable end of guidance for a decline of 110 to 90 basis points. So far, so good in 2016. Each segment disappointed on margin in the first quarter, but better-than-expected sales growth in each offset any negative impact on earnings. Ultimately, Honeywell raised the low end of its full-year sales guidance by $400 million to the $40.3 billion to $40.9 billion range, but kept its segment margin guidance range of 18.9% to 19.3% unchanged, resulting in a $0.10 hike to the low end of its EPS guidance range of $6.55 to $6.70. All told, Honeywell generated enough sales increases (despite some concerns with aerospace and PMT oil and gas exposure) to offset weaker-than-expected margin performance. The company remains strong, and based on current trends, investors can look forward to more upside to come.